I’ve never hosted a Facebook party. What if my whole book flops? What if everyone hates it? Yeah, can’t live life in the what if, right? It’ll drive a girl crazy. I hope, if you get a chance, you can make it to the open house. We’re going a little against normal convention of Facebook parties by drawing it out and making it a come-and-go open house type from 2 till 8 pm (CST). Most experts recommend having it an hour to two hours, max. But Kathy and I, we like to mix it up a little sometime. Call us cutting edge, call us stupid. Either way, our hope extending it longer gives more people the opportunity to participate and makes it easier to participate. 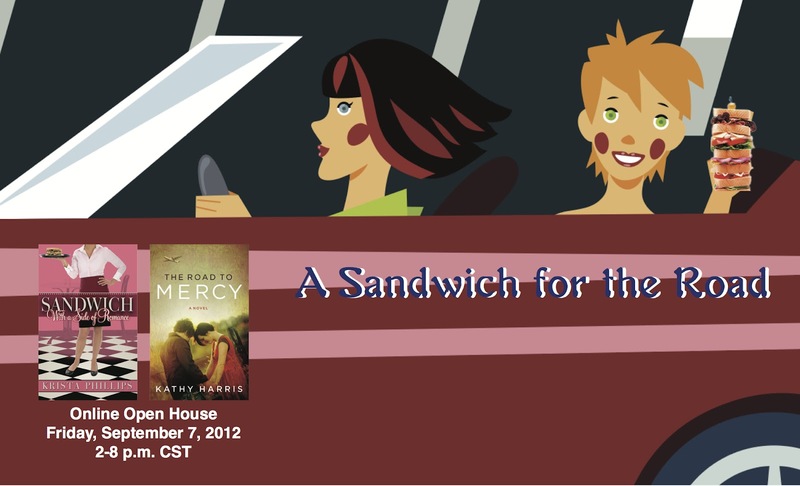 To participate, go to www.facebook.com/asandwichfortheroad. The actual “party” will take place on the facebook wall. Feel free to comment on whatever post fits your fancy! 7pm – Q&A: (almost) anything is fair game! Each hour will have a giveaway, with the winner announced in the first 10 to 15 minutes of the next hour. To enter the hourly giveaway, you’ll need to click on the “welcome” tab on the Facebook page and fill out the entry form (it’s the same place you preregister, but it’ll change a bit each hour!). One entry per hour allowed. All hourly entries will be entered into the drawings for one of the “big” themed basket. 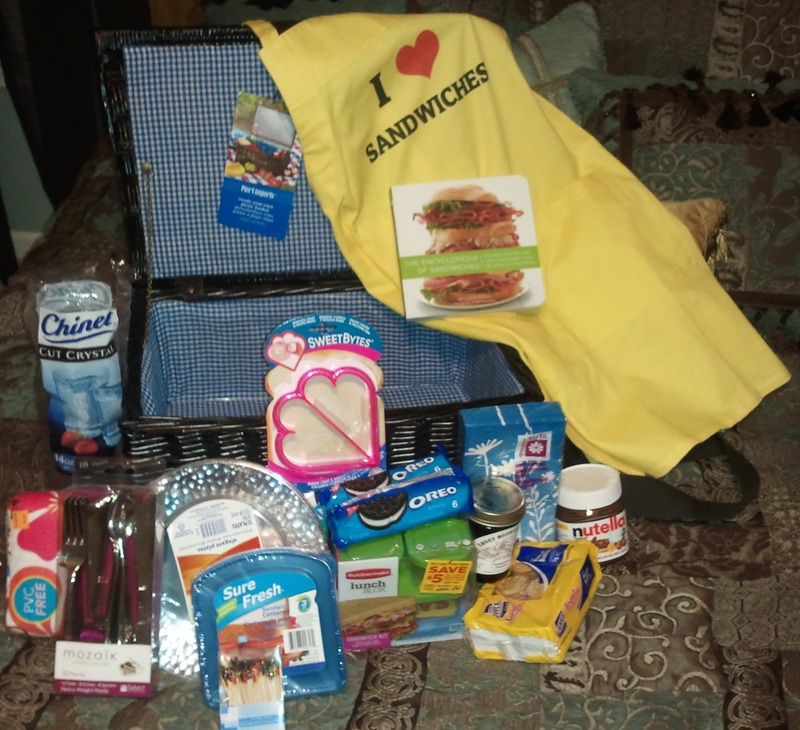 I thought I’d give you a peek at the “sandwich” themed basket I put together!!! I’m SUPER excited about it!!!! If that doesn’t make you want to come to the party, I don’t know what would!!! And DON’T FORGET! We’re giving away a KINDLE TOUCH at the beginning of the party to one lucky person who has preregistered. You have until 1:00 PM TODAY (CST) to register!!! Discussion: Are you a Nutella fan??? Or do you prefer classic peanut butter? I love both. I am so excited for the party. Is there going to be a video feed or something?? I am super excited about the party this afternoon. The what if about the book…. I LOVED IT! Just curious, how is part two coming? Maybe with some sweet baby pickles on the side. 🙂 Have a great day! Actually, my next project (currently not sold, I'm still putting final touches on it!) is something different. I'd LOVE to revisit Sandwich in the future though! We shall see! Can't Wait…..Super Excited Krista!!!! Thanks For The Invite!!! Excited for my first on-line party. So glad it is come and go. Come to party, go get gas in van and kids from school, come to party, go fix dinner and munchies for our family game night. What an exciting day! I'm not on facebook but I did get 2 of your books in the mail yesterday! It was super exciting!! !I am really enjoying it I can't put it down but the kids kinda make me. I don't know anyone who would not LOVE IT. I can't decided who I will give your book to as a gift. I'll be checking book stores in Canada to see if you are there. Off to read what happens with Maddie and Reuben! More importantly Livy, what will she think of Maddie's new job (I'm only on chapter 6) Eeeee!!! P.s. I've never tried Nutella either! The party is lotsa fun, Krista! Course if I were the Kellie who'd won the last hourly drawing, I'd say it was a dynamite party. LOL. Seriously, you've done an awesome job. Back to see what's happening. . . Sorry, I'm not on Facebook, but I hope your party goes well! I know you've been busy with the book release, but I would like another post on Annabelle's b-day blessing. I spent about $70 on it, so it would be fun to know how much stuff you got, how many bags or families you made/helped, and any pictures. But wait until after the party! Funny you mentioned that! I was going to post about it on Wednesday this past week but the day got away from me so I posted later in the day, and wanted a WHOLE day post for that special one! The post will go up either Monday or Wednesday of this week!!! THANK YOU SO much for your gift! You have NO idea how much we appreciate it, not to mention the babies at the hospital!!! I signed up for the party but it appears that I can't participate since I'm not a registered FB user. (I'm assuming that is the problem since I was prompted to "sign up" or "log in".) I could read the posts but couldn't post anything. I hope all went well. And it did go well, thanks for asking!!!! !